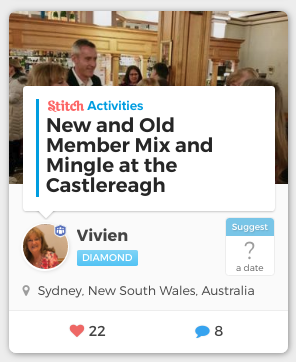 Stitch is a member-driven community, created by members to help make life more enjoyable and full of fun for other members. In this respect we are like many other communities, clubs, and societies, which are often driven by people making life better for each other. But Stitch is different from most other communities in one very important way: it is made up of people who have never met before. This poses a number of challenges, as it's difficult to feel a sense of "community" with complete strangers until you have created a connection to them. Sometimes this means that some cities can have thousands of registered members, but very little community activity ... with everyone waiting until the community is up and running before they get fully involved. Talk about a chicken-and-egg situation! Here is the good news, though: dozens of Stitch communities have overcome this barrier, and have snowballed into incredibly active and dynamic communities, in cities all around the world! Pages and pages of events and activities, with a crazy amount of community engagement creating thousands of connections between members! Wouldn't it be great if every community was like this? Well, that's what this article is for: sharing some of the lessons learned from how communities like Sydney became active, so that everyone in other locations can learn and (hopefully) get the same sort of thing happening in your areas. Even if your area has thousands of registered members, don't expect you are going to be inundated with responses when you suggest your first activity. We've observed that it can take some time for members of Stitch in any given area to get used to the idea of attending events and activities with complete strangers. That's understandable, when you think about it ... most members of Stitch have never really done anything like it before! So it's not surprising that when the first activities in an area get suggested, you won't initially see an overwhelming response. The good news is this means you don't need to plan anything elaborate: a daytime catch-up at a cafe or evening drinks at a quiet venue is usually a pretty good start. Even though you might only expect a small response, however, don't make the event sound insignificant. Let everyone know that this is the start of something BIG ... you're kicking off the community, after all! At the time I made this suggestion, we had lots of members in Melbourne but very little community activity ... and the events which had been suggested until then only had a handful of responses. What was so different about this event that 39 people decided to attend? It was that the event title and description made it clear this event was about making the community happen! This gave it a much greater significance, and meant that all the members who had been patiently waiting for the community to get started were far more likely to overcome their hesitance and come along. Probably the most important lesson we've learned is that most members need to receive an invitation to an event several times before they finally overcome their inertia and come along. The first time they see an activity advertised, they'll think "that sounds interesting", but either are already committed on that date or simply aren't ready to go and meet strangers yet. The second time they see the same activity advertised, they'll think "oh, it's happening again, I guess it must have been good the first time around". They might even post a comment on the event. But they'll still often feel reluctant about attending. The third time they see the activity, they start thinking "wow, this Stitch thing is really real", and deciding that yes, maybe next time, they'll try to clear their schedule and make time to come. And then the fourth time they get invited, they might actually come along. This scenario is no exaggeration; it might actually take a dozen activity postings before someone decides to attend one. I've even had members tell me on several occasions that they've come to the front door of the venue where a Stitch event was being held, only to chicken out at the last minute and go home! It means the very best thing you can do when your community is in its infancy is to organize a regular monthly activity. After you've had your first "Kicking off the community" event and met a couple of local members, it's time to start setting up a regular monthly event. Once again, it doesn't need to be anything elaborate -- it will still be a while before you get many people coming along -- it just needs to be something you keep on doing. Choose a suitable location. Pick a regular day, such as the fourth Thursday of the month. And then just keep on posting! Events like these play a critical role in getting the community to explode. Members who attend begin to feel connected to everyone else and learn how safe and welcoming the community is. And for many of them, that usually means they start posting suggestions of their own. Before long, you're seeing dozens of activities being created every single week. The above two steps are how the Sydney community got started. It began with a morning coffee meeting that had six members attend. Within six months, the community had over 50 members coming along to the regular monthly events. But there was one additional ingredient that was critical in getting the community moving. By specifically making the event for new members, it made them much more likely to overcome their shyness at joining a new community and come along. Of course, lots of existing members come every month too, as they would be the ones welcoming new members to the group, helping with like name tags (useful once the community becomes large), and spreading the message about how to be a good member of the community. They would often use the "new members" section at the top of the community home page to send messages to newly-joined members, inviting them to come along. So when you set up your monthly get-togethers, we strongly recommend you make it very clear that new members should come along, particularly when the community is just getting off the ground. And make sure you give them all a round of applause when they come to their first event. After all, it's not often you walk into a social event where you know absolutely nobody! 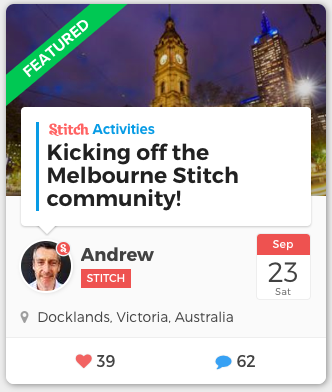 Stitch Groups are a key way of connecting with your local community members around interests; everyone who joins Stitch in your area is going to see and get the opportunity to join local interest groups. 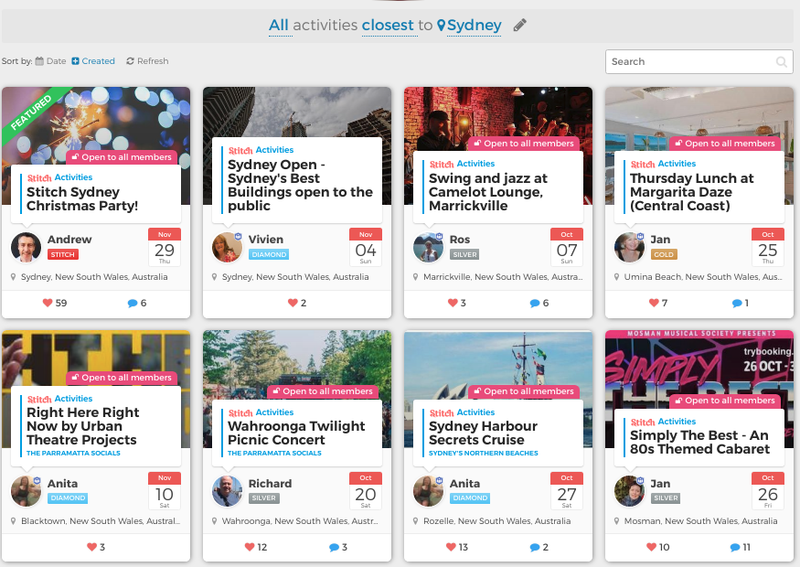 So if you're keen to get your community started, go ahead and create some local groups! These can be quite general in nature ("Houston Stitchers", for example), or super-specific ("Houston ballet enthusiasts"), it's totally up to you. But either way, you're helping create a place for local members to connect and discuss what you want your local Stitch community to be. 5. Be persistent. Don't give up, it's worth it! In case it's not already clear, you need to be persistent. Success doesn't happen immediately, and some of your first tentative steps to set up an activity may feel as though you're being completely ignored. You might post an activity that gets a dozen members saying they are interested, but only 2 show up. Don't be discouraged! The ten members who didn't show are still just figuring things out. They'll come along eventually if you keep at it. The message we consistently hear from Stitch Champions (members who have posted 3 events on Stitch) is that they feel they get more out of the community than anyone else. Every time you create an activity, you are creating an opportunity for someone else to overcome their own isolation and create new connections in their lives. You're giving them a great gift, even if they don't realize it at first. Research has shown us that the people who are happiest in this world are those who do things for others, so give it a try and see how it makes you feel! Finally, remember that you are not alone. If you want to help grow the community in your area, there are plenty of people willing to help. Reach out to us, and we can put you in touch with Stitch Community Champions who can help with advice and guidance. We can help promote the activities you want to host. And we can even support you with initiatives to grow the community in your area. We've all got the same goal, which is to make the Stitch community great for all our members, no matter where they live. Now that's an exciting thought, isn't it?